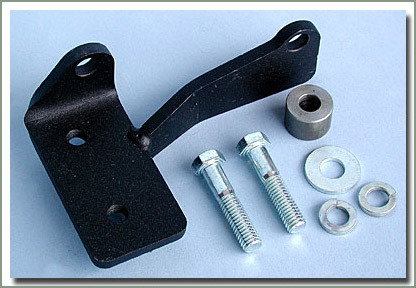 These mounts allow the installation of General Motors V-8 engines into Land Cruiser frames from 1958-1/90. 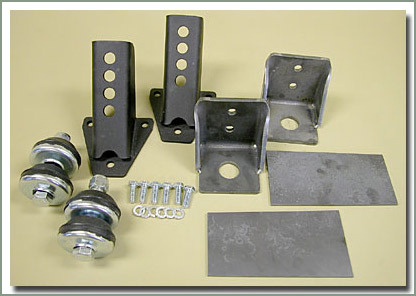 This kit includes weld on frame scab plates, mount brackets, engine brackets, mounts, and hardware. Includes illustrated instructions. Installation requires welding. This V-8 Fan Shroud bolts directly to the factory radiator support. This shroud will allow a maximum fan diameter of 19 inches. Depending on the position of the V-8 engine in the engine compartment, the stock radiator support may need to be repositioned toward the passenger side to clear the maximum size fan. 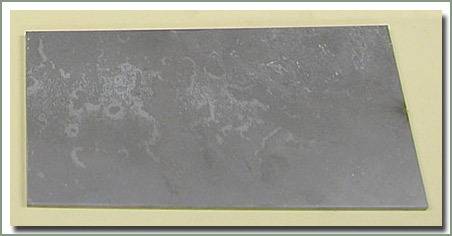 Shroud comes in black wrinkle powder coated finish. Does not fit 1/79 & Later 40 Series with Factory Air Conditioning with the wider radiator. 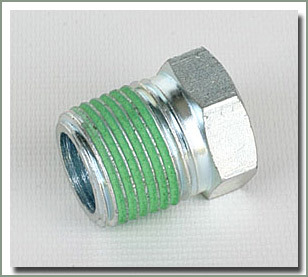 To determine which radiator and support you have, measure across the bolt holes that attach the radiator to the support. If the measurement is 21 inches from center of bolt to center of bolt, this is the non air conditioning model and this shroud will fit. If the measurement is 22 1/2 inches, this is the wider type that this shroud will not fit. Cable length is 29 inches with a 21 inch housing. End of cable is not threaded. This cable will work with Holley and Weber caburetors and most V8 applications. Mount to the rear of the carb. SOR is not responsible for incorrect length. 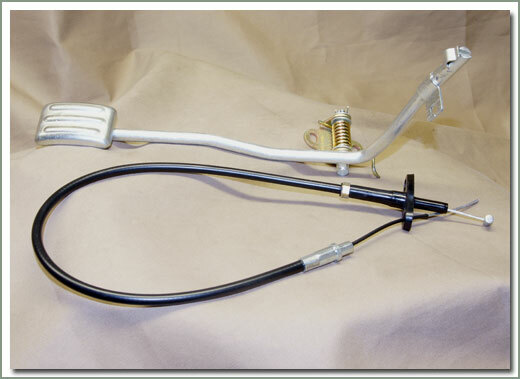 This pedal and cable will work with Holley and Weber carburetors and most V8 applications (see page 043). Requires drilling. Does your Cruiser have an automatic transmission in it? Do you want to put an automatic transmission in your Cruiser? Specter has your Shifter. B&M is the most respected name in automatic transmissions and components. The B&M Starshifter will shift GM TH350, TH400, Ford C4, C6, Chrysler & AMC transmissions. This shifter is designed with a positive reverse lockout for safety, and will not allow the shifter to be positioned in reverse or park without pulling the 'T' handle trigger. Shifter incorporates a gear position indicator and includes a neutral safety switch. Shifter can be operated like a normal detent type shifter, or by lifting the 'T' handle and pulling the shifter all the way back, it can be converted to ratchet action. This way the shifter can be hit with your hand, and it will only shift one gear at a time. Comes complete with installation brackets, cable & illustrated instructions. If you have a 700-R4 trans, or a reverse pattern valve body, call us, other shifters are available for these transmissions special order. 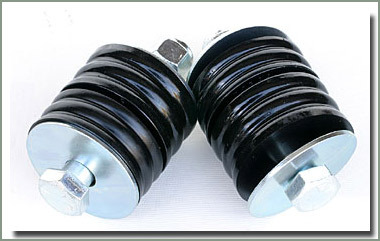 If you have always wanted separate transfercase shifters for Hi & Low and 2 Wheel Drive & 4 Wheel Drive, here they are. These high quality Advance Adapters kits fit the stock 4 speed transmission and transfercase behind the stock 6 cylinder engine or a V-8. Other kits are available for other transmission and transfercase combinations (call for price and availability). 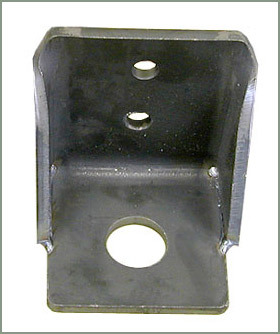 This bracket allows the installation of the Original Toyota Slave Cylinder onto the General Motors Bellhousing. Comes with mounting hardware. 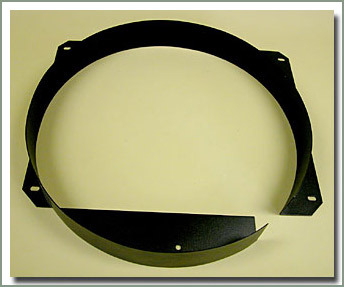 #330-911 - This special pressure plate was designed by Centerforce specifically for Land Cruiser V-8 conversions. 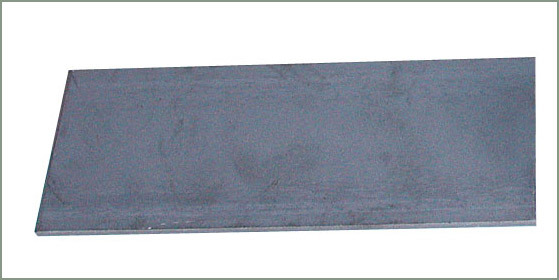 This is the correct pressure plate to use with the stock Toyota clutch hydraulics. 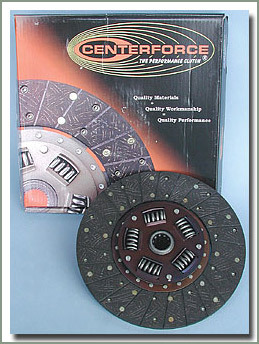 #330-912 - This is the Centerforce disc that is matched to the Centerforce Pressure Plate. 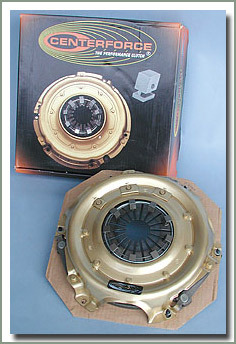 This is the clutch disc for GM V-8 conversions. 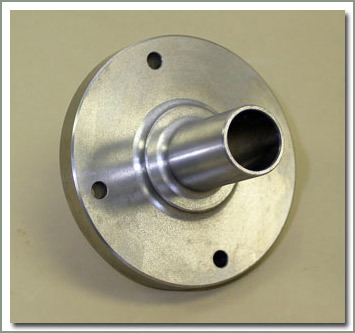 #330-913 - This precision machined flywheel is manufactured by Centerforce for your GM V-8 engine. 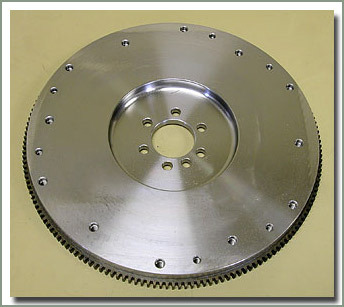 This flywheel is a perfect match for the Centerforce Pressure Plate, and their Clutch Disc. 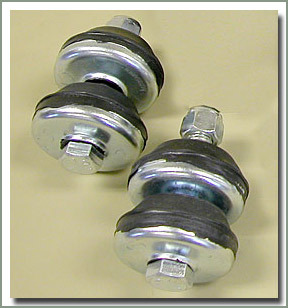 Fits 1958-1984 40 and 45 Series with V8 or V6 conversion. 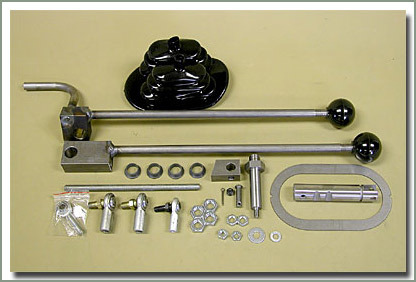 Kit comes with master cylinder, slave cylinder, hard line and stainless steel soft line. 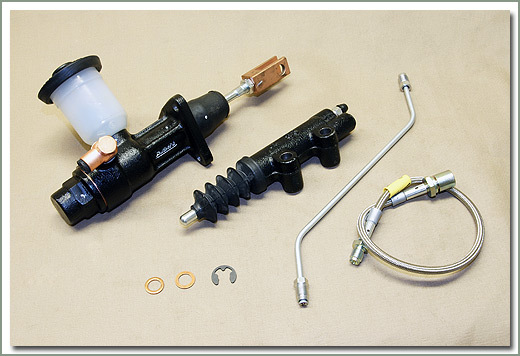 This kit is recommended when doing a V8 or V6 conversion for the correct throw of the clutch fork. 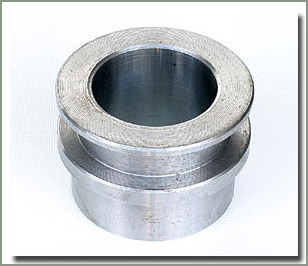 Fits 3 or 4 speed with small diameter front bearing retainer. 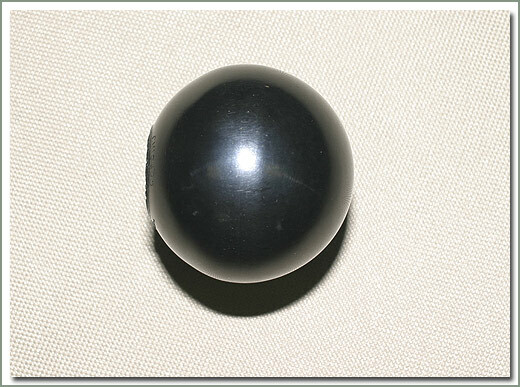 Inner diameter is 1.375. 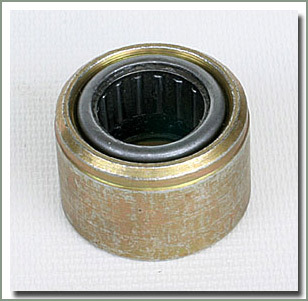 Bearing outer diameter is 3.710. Clutch fork groove is 1/2 inch. 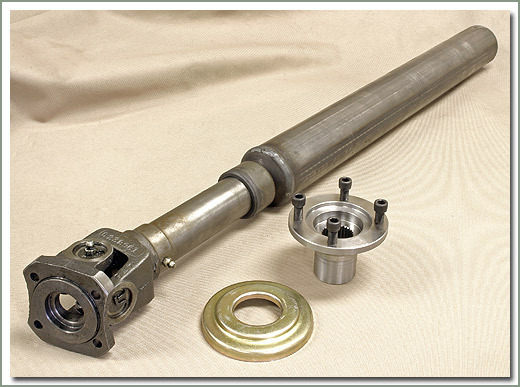 This kit incorporates an extended length slip yoke, small diameter drive flange and u-joint into one slick package. This solves two problems, vehicles with a great deal of front wheel travel have a problem with the stock short slip yoke slipping all the way out when the axle drops to the lower limit of suspension travel. 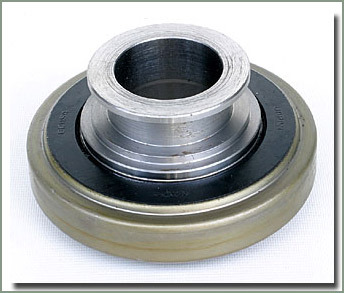 The Extended Front Driveshaft Yoke solves this problem. 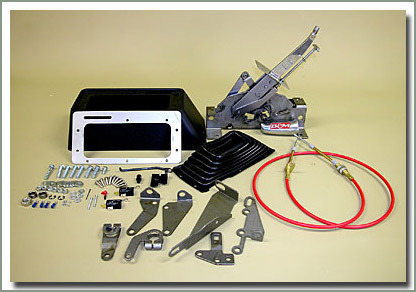 The other problem this kit solves is when an automatic transmission is installed there is a clearance problem between the front output yoke on the transfercase and the transmission oil pan. 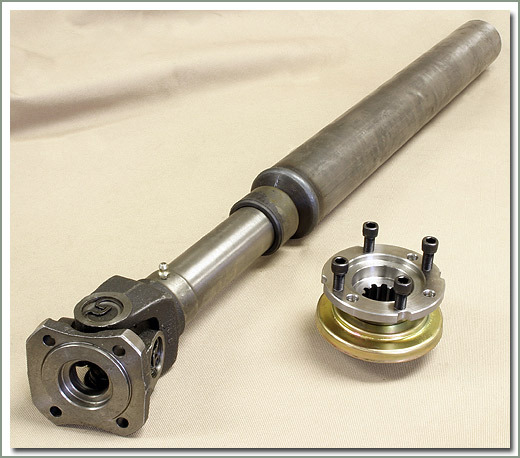 This kit has a smaller than stock diameter front output shaft drive flange which solves this problem. 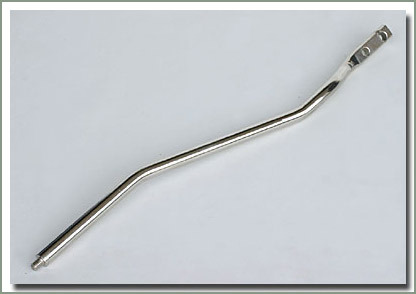 Available for transfercases with coarse or fine splined front output shafts. 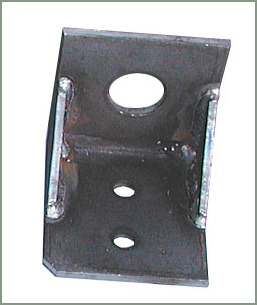 Requires cutting and welding of the original front driveshaft.